We bought this bed in a box back in 2016 October, our first bed in a box, it has been the BEST sleep we have had in years. Here it is 2019 and this bed has proven to be the best purchase we have ever made on Overstock. Love it so much that we bought a Queen sized Lucid brand recently for our guest room. Select from plush, medium, and firm levels of cushioning with this full-size mattress set from Beautyrest. This ComforPedic mattress has six inches of base foam, three inches of support foam, and a top layer of gel memory foam for total-body support. I do a lot of online shopping and do not write reviews often. However, I have found that I write reviews for a lot of the overstock products I buy because I have been consistently surprised by their quality. For example, comforpedic by beautyrest is a discontinued product line, which would made me wonder if there was some issue with the product line due its implied lack of commercial success. 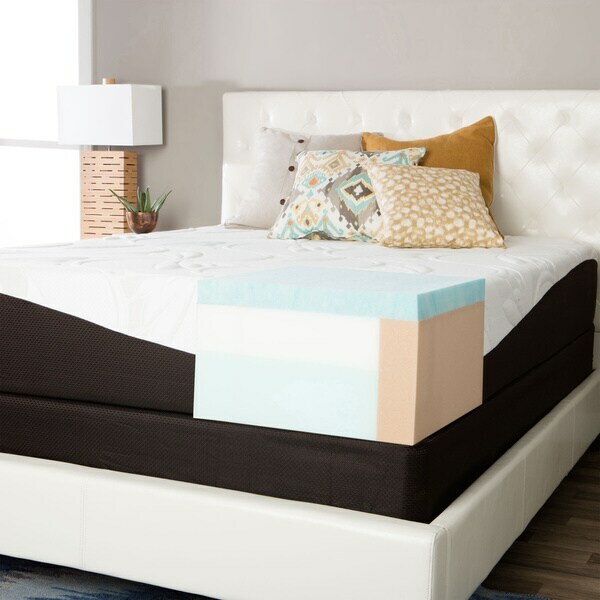 I took the plunge because I have had good experiences with overstock and the numerous other happy reviews for both this product and other versions of it and this mattress still surprised me! It is AMAZING. After weeks of bickering with my husband about whether we wanted another innerspring mattress and weighing price/durability/motion isolation/sleeping hot and other numerous conflicting concerns we had with traditional innerspring mattresses, I ordered this in a medium comfort and paired it with with Malouf's tencel bedding + ice tech mattress protector. This combination sleeps cooler than our previous pillowtop coil spring mattress, is both more supportive and yet plush at the same time (I am now a gel memory foam convert), and has triggered somewhat of a bedding obsession - I am now scouring Malouf pillows on overstock and deciding if I can get any closer to bed perfection! One thing - the frame is kind of a "you get what you pay for" type situation, but presumably not the driving factor behind a purchase. There might be better gel memory foam beds out there for the better price points, but I am 100% happy with this so far. I purchased two queen size for a game room that has to double as extra sleeping for our teenage kids when friends or family come to visit. I ordered them expedited shipping, but they did not arrive in the specified time and Overstock customer service refunded the expedited fee without any hassle at all. I had to construct both box frames by myself -- I did use my own screw driver instead of the little one they provide. Construction is straight forward. One piece of wood on one of the frames was cracked, but it does not seem to have compromised the strength yet. The mattresses are heavy but not so heavy that I couldn't maneuver them myself (with effort, though.) They did not actually smell as warned they could. All in all the two frames and set up and clean up took about 2 1/2 hours. My boys now actually prefer to sleep up in that game room on those beds than in the bunk beds in their own room. I laid on them and they are indeed really comfortable. I researched mattresses for quite some time before I made a decision. I have been sleeping on this for about 3 weeks and I don't think I have slept as well in ages. I wanted a knock-off version of a TempurPedic that I had slept on in the guest bedroom at a cabin owned by a friend. It was after that when I realized the price of that mattress,then simply could not justify the cost of it! Then, I read a number of comparisons where the ComforPedic beat out the mattress I originally wanted from Tempurpedic.. Done deal! It arrived ahead of schedule, I found it relatively easy to set up, my husband and I did the frame together. The mattress had no odor, or as they call it "gas off smell" that we could detect. The first night I slept like a rock and woke up with no aches in my arthritic knees or shoulder. It simply felt wonderful to feel good all over knowing how supportive this was to sleep on! This was a great decision for us! Our previous mattress was a very old Select Comfort which has broken down to the point of being painful. I may end up buying another one for our guest bedroom! The price was great and I have shopped Overstock before, I know their customer service is A+ all the time had there been any issues! I wouldn't hesitate. Great deal on a great mattress! Thank you Overstock! My friend bought this exact bed. Great bed!!!! Very firm but not uncomfortable. I woke up with no body pain at all. Would recommend this bed! I was soooo excited when I ordered this mattress & I was even more excited when I saw the delivery truck in my driveway!! You will be amazed at how much better you will sleep at night after one night of sleeping on this Mattress!! The quality is amazing & I know I’m going to use this for years & years !! We ordered the medium firmness and the mattress is amazing. However you have to build your own foundations, which was not any fun because the hole didn't line up correctly but we made it work. Overall for the price it's worth it. Would be 5 stars of the wood was better quality and the holes were drilled correctly. Again, it came in a bag........really? Yes really! It is amazing and it sleeps so well, I would not hesitate to recommend this mattress and I'm very critical, kinda wish I would have ordered the firm, but with that being said, this one is great, just wondering what the next level up would feel like, cuz this one feels like heaven! This mattress is so comfortable. I wish I had purchased one sooner. This has definitely cleared up some back problems from sleeping on a 20-year traditional mattress. I love it! Easy to assemble. Comfortable but firmer than anticipated. I bought it for my son. He is very happy with his new bed! Soft but very good spine support! I was refer to overstock site by friend! Which I was looking for bed after 10 years! So I searched all type of bed sites and non came close to the prices and cool site to view what type of bed I want. Finally I purchased a bed and delivery was so fast and furies. 2-4 days I was sleeping like a baby again! 5 star! Go cop it now! "Will the firm queen size version work well with an adjustable base?" This mattress is not designed to be used with an adjustable base. "Do you put the cover on top or bottom of the foundation once you assemble it (picture would help)"
You put it over the top that has the slats close together. We went to local furniture stores, saw the Beautyrest products and was sold on their comfort. Overstock's prices are fantastic!!!! We had previously owned a Comforpedic Beautyrest Mattress and after reading the reviews, we decided to order this one.